Colorful bandanas can be worn, hung, or used for info like where to set up your tent. Calling all foragers, hikers, and amateur rangers. 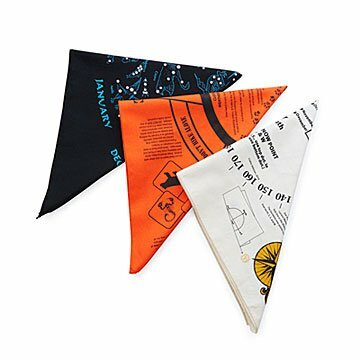 This trio of bandanas will inform and delight the outdoor enthusiast in all of us. An excellent gift for adventurous kids or novice backpackers, the cloths include helpful tips and educational advice like where to set up your tent, how to spot the North Star, and instructions for tying hitch knots. Designed with vintage flair reminiscent of a Wes Anderson film, the colorful cloths can also be fastened around your neck to keep sweat at bay or hung as mini-tapestries on a wall. When it's time to hit the trails, just slip the lightweight cotton in your bag and see where the adventure takes you. Made in California, which is home to approximately 280 state parks. The manufacturer assumes no legal liability or responsibility for the accuracy, completeness, or usefulness of any information provided on this bandana. Our sons like to camp and hike in the mountains of Colorado to the prairie fields of the Midwest states. They will be great for the hard-to-buy for outdoorsmen. I like the bandana with knots (always good for camping) and also the constellations (perfect for star gazing). Love uncommon goods. Many unique practical products! My favorite go store for gifts!